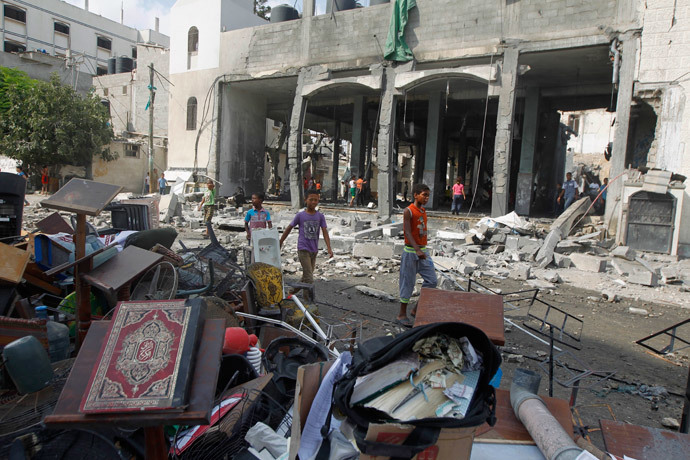 JNN 23 July 2014 Gaza : Israel kept up attacks on Gaza on Tuesday, killing three Palestinians and hitting over 70 targets, including five mosques, a sports stadium and the home of the deceased Hamas military chief. The latest casualties in the fortnight-long violence have brought the Palestinian death toll to 620, according to AP. Almost 100 of them are children and many others are civilians. A United Nations school which is helping to shelter displaced Palestinians in the center of Gaza also came under attack from Israeli fire as a team was inspecting damage from the day before, a UN official said. The official mentioned that a team, who had been given permission by Israel to enter, were at the school, which is run by the UN in Al-Maghazi, when Israeli tanks resumed their shelling and hit the building. The Zionist entity announced on Sunday evening that 15 Israeli soldiers from the Golani Brigade were killed since Saturday night in fighting in Gaza, bringing the total number of troops killed in the ground assault on the besieged strip to 20. Israeli daily, The Jerusalem Post reported that seven occupation soldiers from Golani’s 13th Battalion were killed as their APC drove over an explosive device and caught fire. Shortly afterward, soldiers from the battalion engaged in a gun battle with resistance fighters, and one soldier was killed in the exchange of fire, according to JP. Hours later, two soldiers were killed in a firefight with resistance in Gaza. Three members of the Golani Reconnaissance Brigade were also killed when a fire tore through the building they were in, shortly before 9 a.m., the Israeli paper said. “The military was still completing the process of identifying the fallen soldiers. The families had been notified of the soldiers’ deaths,” JP added. This entry was posted in Middle East and tagged Ban Ki-moon, Benjamin Netanyahu, Gaza, hamas, Hamas leader, Ismail Haniyeh, israel, Israeli military, Israeli soldiers, John Kerry, Palestinians, UN Office for Humanitarian Assistance. Bookmark the permalink.